Our hair on the head is often called the crowning glory. It gives us protection from the elements and enhances beauty. 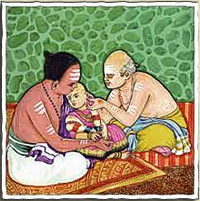 Chudākarma or Mundana is the Samskārā where the child’s hair is cut for the first time. The Chudākarma ceremony marks a new phase of life for the child. It symbolizes cleansing, renewal and new growth. It is also said that the new hair that grows is strong and clean. Mantras are chanted as the child is given blessings of long life, prosperity and fame. According to Susruta, “shaving and cutting of hair and nails removes impurities, gives delight, lightness, prosperity, courage and happiness”. Charaka opines, “Cutting and dressing of hair, beard, nails gave strength, vigor, vitality, life, purity and beauty”. Chudakarana was a religious ceremony as early as the Vedic period, consisting of wetting the hair, prayer to the razor, invitation to the barber, cutting the hair with Vedic verses and wishes for long life, prosperity, valor and even progeny of the child. In the opinion of the Grhyasutras, the ceremony took place at the end of the first year or before the expiry of the third year. Manu too prescribes the same. Performed in 3rd year it is considered the best by the learned, in the 6th or 7th year it is ordinary but in the 10th or 11th year it is worst. The arrangement of the top-hair or Sikha was the most important feature of the Chudakarna and made according to family tradition. The descendants of Vasistha keep only one tuff in the middle of the head, of Atri and Kashyapa two on either sides, of Bhrigu remain without a tuff, of Angiras five. Later on one tuft became universal in northern India, probability, due to its simplicity and decency, though in Deccan and South, the ancient traditions are kept alive to an extent. The following main features of the ceremonies can be distinguished. The first is the moistening of the head. The second is the cutting of the hair with prayers for non-injury of the child. The third is throwing away the severed hair with cow-dung. Hair is regarded as part of the body and was subject to magic and spell by enemies. The fourth is keeping of top-hair. It was a racial fashion and helped distinguish families. Most importantly the ceremony was for the child’s long life. Is there any connectivity between life and the top-hair? Says Susruta “Inside the head near the top, is the joint of a Sira (artery) and Sandhi (a critical juncture). There is the eddy of hairs is the vital spot called Adhipati (overlord). Any injury to that part causes sudden death”. The protection of this vital part was considered necessary, hence the tuff of hairs.